Those looking to aid the Breast Cancer Research Foundation can pick up a new Pink Mercy skin for a limited time. But it's only available for a limited time! Throughout the past year of Overwatch patches, there's been a lot of talk about Mercy. A lot of that talk has related to nerfing Mercy or clipping Mercy's wings. But for Tuesday's Overwatch patch, Blizzard is focusing on Mercy for a different reason. 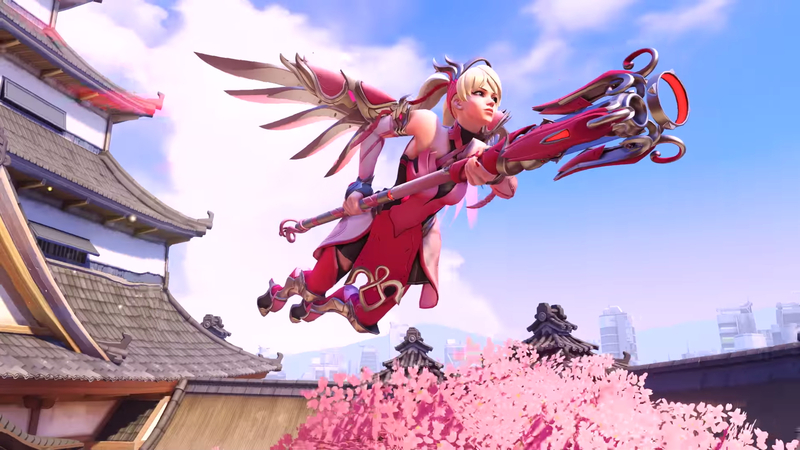 With the May 8 Overwatch patch, Blizzard is offering up a new Pink Mercy skin for purchase for $14.99. A full 100 percent of the proceeds for this skin will go towards the Breast Cancer Research Foundation, aiding their mission to help end breast cancer. Those looking to show their support beyond picking up this skin can also pick up a Pink Mercy T-Shirt, pick up special Pink Mercy icons and drops, and even assist with the cause by watching special charity Twitch channels. Full details on how to help with this charitable effort can be found on the Overwatch website. The Pink Mercy skin can either be purchased in-game or on the Overwatch Shop. It should be noted that the Pink Mercy skin is bound by account and platform. The Pink Mercy skin and all of the Pink Mercy goodies will only be available through May 21, so be sure to pick it up now before it's gone forever. The May 8 Overwatch patch also includes a handful of bug fixes for some of the game's other heroes. For the full patch notes, check out the Overwatch forums.